Concealed Handgun 2 begins where most Concealed Carry courses end. This is our Core Handgun Skill Builders course. Level 2 will continue reinforcing the defensive philosophical overlay with an expanded review of Handgun 1 “Ohio Concealed Carry” fundamentals. In Handgun 2 we are drawing from a holster and then engaging multiple targets while using cover or on the move. Always standing in one place, holding your gun at full extension as taught in target shooting at most shooting ranges may have little value in real life defensive situations. We live in a dynamic world and most elements are in motion. It is imperative that you learn the fundamentals of shooting while using cover or while moving in defensive encounters. How close your opponent is will determine your tactics. 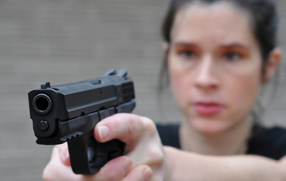 The student will practice the defensive use of a handgun whether your attacker is arms length or farther away. This class will teach you the fundamentals of keeping your handgun up and running no matter what the situation demands. Dry fire practice & live fire routines will be discussed and demonstrated as a way to vastly improve your skills while in the classroom, at home and on the range. This is a practical course taught on the range and not in the classroom. The day on the range will end with the student engaging 2-4 scenarios that allow each person to practice and demonstrate the skill sets rehearsed during the class. When signing up for a class be sure to fill out an online Personal Defense Systems Registration Form for each person attending. We need your payment and your registration form in order to process your request.